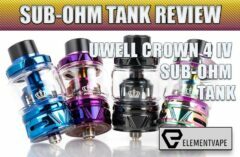 There are times when I hate reviewing sub-ohm tanks, because the technology has gotten so advanced, that the gap between good and bad is shrinking by the day. And as a result, we’re forced to be hyper-critical of devices, simply because their “X” isn’t as good as another device’s “Y” … like I had to do with the Voopoo UForce T1 sub-ohm tank in this review. I’m not the only Spinfuel VAPE Reviewer to feel this way either, check out the review published just yesterday for the Wotofo x Rig Mod FLUX and Flow Pro Tank. “These days a poor performing Sub-Ohm is an aberration, most sub-ohms in 2018 perform just fine, and the Flow Pro is no exception.” So you see, this is becoming a problem for those of us that make our living writing about vape gear in order to guide our readers toward the ‘good stuff’. But there’s nothing about the UForce T1 that makes me say, “I have to grab it instead of [TANK X].” There’s no standout feature or performance note that makes me want to pack up my Prince’s (review here) or Valyrian’s (review here) or FireLuke’s (review here) for the trash heap, illustrating my original point one more time. 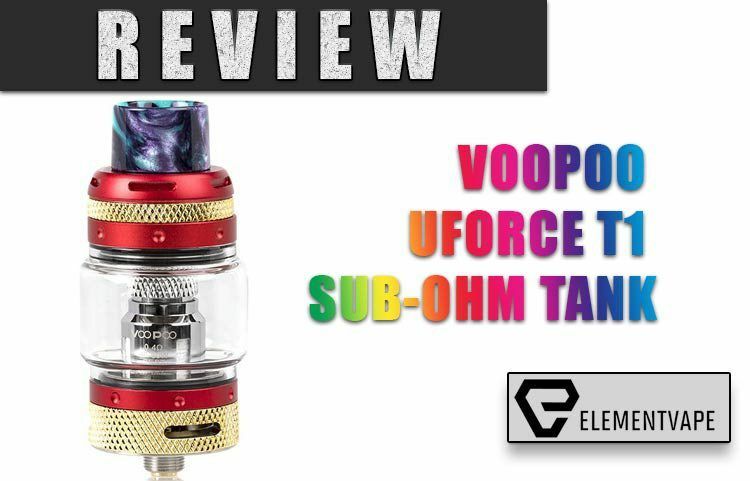 The UForce T1 is actually an updated version of the original UForce, (reviewed here) which I didn’t get to test while reviewing the Voopoo Too mod, but from what I can gather the UForce T1 is a natural evolution of the coil system, while the exterior received a knurled, semi-futuristic design makeover. 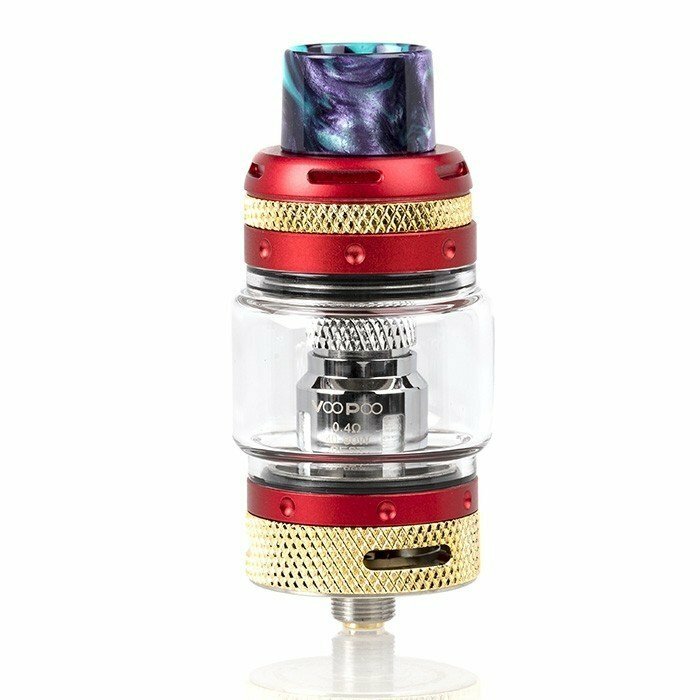 The problem is that makeover makes it look an awful lot like the SMOK TFV12 Prince tank, save for a few extra millimeters of height, a slightly more bulbous 8mL capacity tank, and knurling where the Prince has some engraved lines. Now, I know a LOT of tanks are following this design model, but none as closely as the UForce T1. 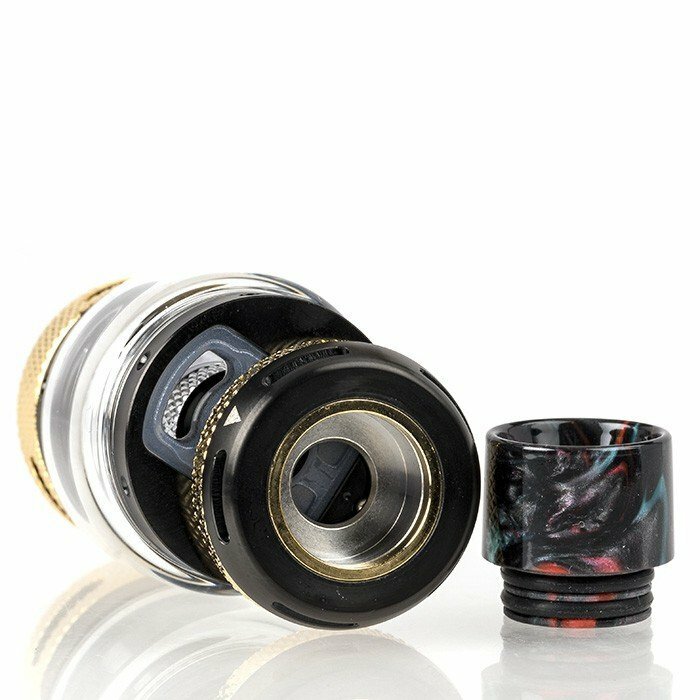 I do need to say that the sliding top-fill port is much nicer than SMOK’s offering, which is button-operated, versus the T1’s spring-loaded cap. I never thought it would matter until I needed an extra pair of hands in a crowded park, and the sliding cap allowed me to fill without awkwardly asking a bystander to hold my bottle of e-liquid. 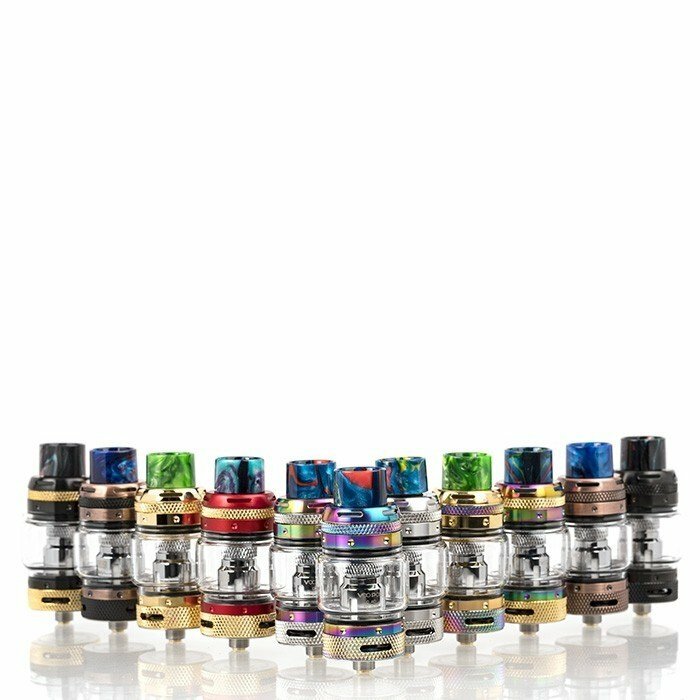 So, this is a major feather in Voopoo’s cap. Another notable difference is the three-slotted airflow, as opposed to the standard dual port openings. I didn’t detect much improvement in airflow versus the traditional format, but apparently the airflow is designed to flow upwards more easily than other styles. I suppose your mileage may vary, but these details usually come down to splitting hairs. Finally, there’s the now-standard Resin drip tip, which does its job well enough. It stays cool on the lips but could be a touch longer to avoid any inadvertent contact with the top cap, which gets very hot at higher wattages. For all the hype about capacity and design, the real stars of the UForce T1 tank are located inside the device. For starters, the thing proved to be pretty damn leak-proof during my two-week testing period. Other than the usual condensation that happens when temperatures change, the T1 was one of the more reliable tanks in my collection, at least in this department. The other notable “highlight” of the T1 tank was the pair of coils that came in the box. 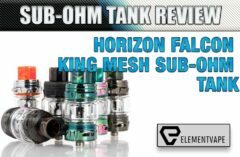 Both the 0.4-ohm Kanthal coil and the 0.13-ohm mesh coil were decent mid-wattage performers, with solid flavor and vapor performance from both. If I had to lean in one direction, I found the Kanthal coil was slightly better overall, with brighter flavor and richer vapor. When staying right in the middle of their stated ranges both coil heads were at their best. Though each was listed to go upwards of 100 watts, I found that both started to scorch above 80 watts, regardless of which mod I had attached. This is a little misleading for newcomers, who might push these well past their actual limits. In terms of longevity, the Kanthal coil was slightly more durable, giving me a decent six days of performance before flavor started to wane. But neither is winning any endurance records, especially when compared to some of today’s better sub-ohm tanks. That said, juice consumption was surprisingly frugal considering how flavor and vapor focused the tank is. As a side note, after nearly a year of seeing mesh coils pop up in every possible format, I have to really see the advantages. Sure, they perform well and can keep up with modern standards, but is there really any flavor and vapor advantage to using them? I’m not convinced…yet. When my SMOK TFV12 Prince COBRA arrives and I get the chance to try it out, I’ll see if there are improvements to be had. I’ve been hearing good things from my co-workers about the 0.15ohm V12 Prince Mesh Core provided with the Prince COBRA. 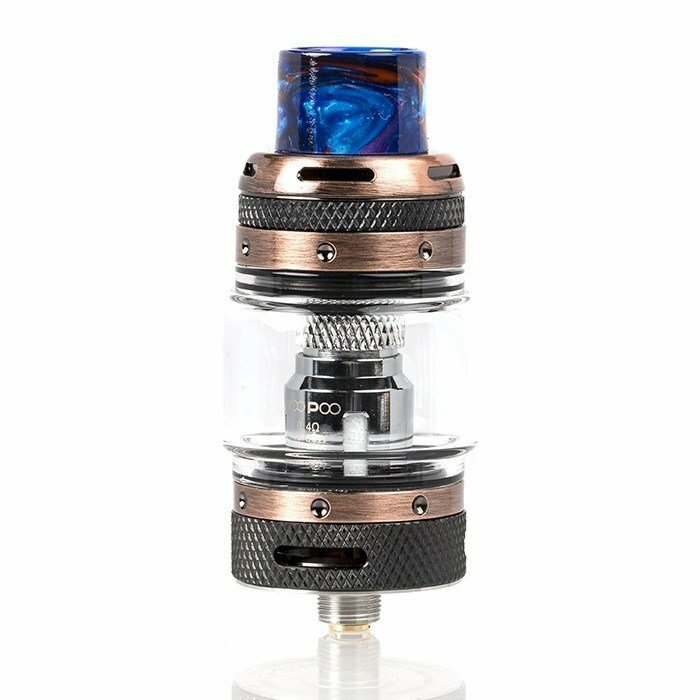 So, while it seems like I’m nonplussed by the Voopoo UForce T1 sub-ohm tank I enjoyed using it while the experience lasted. It was a solid, no-frills tank that I liked bringing out for nights on the town, thanks to its large capacity and light juice consumption. But those were the primary reasons I used it. Would I replace my collection of Prince’s or Valyrian’s in favor of the UForce? Not a chance. I use the term “solid” far too often when describing vape products, to the point where I feel like it’s being misinterpreted as a glowing review. Solid means just that – a reliable, base product that does what it says it will. 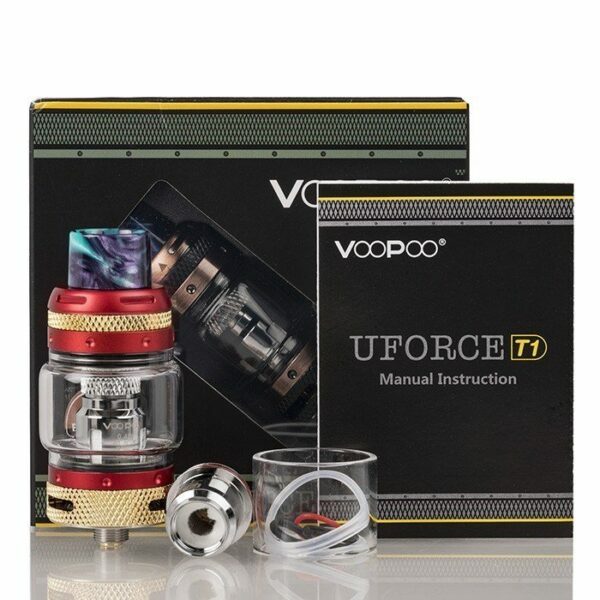 And in turn, the Voopoo UForce T1 does what it says it will, and most vapers will be more than satisfied with the tank. But there isn’t one superlative I can use about this tank, since it’s structured similarly to so many others, and performs right in the middle of that same pack. If I had to pick a target audience for the Voopoo UForce T1, it would be people who know how to gauge vape quality and know how to tinker with wattages until they find a sweet spot for each coil. Beginners will probably struggle with the T1, burning coils because of the “100W” upper range written on the side, and wondering if this performance was what everyone’s been talking about all these years. If you score one of these with a new mod kit like the VOOPOO BLACK DRAG, a Kit I’m about to begin reviewing, by all means, use it and enjoy it – the T1 does more than enough right. 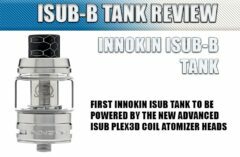 But if you’re in the market for something more akin to a premier vaping experience, I can’t give a compelling reason to choose the T1 over so many other, superior contenders.